A friend of mine was reading my blog and saw that I’m terrified of cooking fresh fish. Wanting to rectify my dilemma she wrote an excellent piece on how you can cook fresh fish at home and included a Homemade Salmon with Sweet Potato Fries recipe. She also gave me permission to reprint her article to share it with my readers. So Here is Angie’s advice on how to cook Fresh Fish at home. I recently read in my friend Louise’s blog that she didn’t cook fresh fish at home. In the same week I spoke with at least 3 other friends who said a similar thing about being intimidated by cooking fish or thinking that cooking fish would stink up your house. I think I even remember my mom saying that to me a while back when I said I’d made salmon for dinner. Well, I want to set the record straight right here and now! Cooking fish is easy and it does not stink up your house if you do it right! Let’s address these issues one at a time. 1. Myth: Cooking fish will stink up your house. There are two things you can do when handling and cooking fish that will leave you with a smelly kitchen. Follow these steps and you won’t have that problem. The first rule of a non-smelly kitchen is to remove the wrapper that your fish came in and put it in your outside trash. Most smell from fish comes from the wrapper in your trash can. The second rule is never fry fish in your house! I grew up in the south, and know that there’s nothing better than fried fish. But like we do it in the south, have your fish fry outside, not in your house. 2. Myth: Cooking fish is hard and should be left to professionals in restaurants. If you can turn on your oven, you can cook fish. The key to cooking good fish is to not over cook it. I’ve cooked both farm raised and wild salmon and have found that the wild salmon needs less cooking time. As long as you watch the clock and take your salmon out of the oven at the right time or even a little early you’ll have a delicious, healthy dish. I tend to be more of a naked cook, meaning that I don’t like a lot of sauces or embellishments on a good piece of meat or fresh veggies. We eat a lot of steamed or roasted veggies with little more than salt and pepper on top. The same goes for a nice piece of meat or fish. That said, below is a recipe for salmon with a simple sauce for those of you who prefer toppings on your fish. Along with that is a recipe for very simple sweet potato fries that my kids love! Speaking of kids, a family member said the other day that kids don’t like fish. Well, I beg to differ! Salmon is one of my daughter’s favorite foods. Maybe it’s because we live in the Pacific Northwest, but fish is not an icky food in my house; quite the opposite. Hopefully some of you out there who believed Myths #1 and #2 above will give this recipe a try and see how easy it is to prepare your own fresh, healthy, tasty fish in your own home! 1. Run your hand across the top of the fillet to make sure there aren’t any bones. If you feel a bone remove it with your fingers or a pair of pliers used in the kitchen. 2. Mix ranch dressing, mustard and dill in a small bowl. Mix in bread crumbs if you are using them. 3. Place fillet skin side down on a greased cookie sheet. spread mustard mixture evenly over top of fillet. 4. 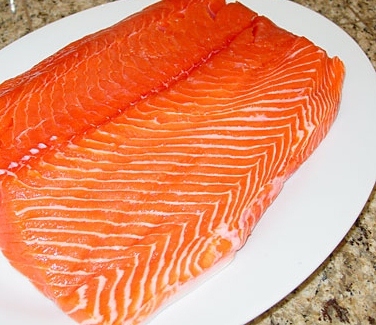 Place fillet in an oven preheated to 350 degrees and cook for about 15 minutes for wild salmon and 20 minutes for farm raised or thicker fillet. Salmon should flake easily with a fork when finished. 1. Cut sweet potatoes into sticks that are fry sized making sure that no stick is more than about 1/4 inch thick in either direction. 2. Put fries into zip top bag then add oil and salt. Squeeze out all the air and zip the bag. Squish potatoes around until they are well coated with oil and salt. 3. Pour potato sticks onto a cookie sheet or baking dish in a single layer then roast for about 30 minutes at 350 degrees turning sticks over half way through cooking. Angie is in my MOMS Club and has been a great friend who helped me in my greatest time of need just by being part of MOMS Club. She blogs at Angie’s Suburban Oasis often about recipes, volunteers for MOMS Club and at her kids’ school. She also finds time to write the occasional bit of code for a local community college. Thanks for the tips on how to cook fish. I’ve never cooked it myself, but I love the taste of salmon. We eat fish at home at least once a week! And those sweet potato fries look absolutely yummy! I’ve been searching for some sweet potato fries recipes. Thanks! I’ll have to try the sweet potato fries recipe, that sounds great!